Mormon Wookiee: #62: Bad lungs. Good mom. Happy Mother's Day to all the mothers, future mothers, and all the other women in the world who put up with men like me on a day-to-day basis. As I was thinking about my mom today, it reminded me of a particularly difficult time in my life when I needed my mom more than ever. One afternoon in the summer of 1999, my family was at Hogle Zoo in Salt Lake City. As we walked toward the polar bear exhibit ("Hey look! Some sleeping bears! "), I suddenly felt an excruciating pain in the left side of my chest. As it continued to get worse, I realized that I may be having a heart attack, which seemed ridiculous to me as a 16-year old. I remember thinking, "What the heck is going on? I don't eat THAT bad!". The pain continued to intensify and my parents quickly decided to take me to the emergency room (sorry polar bears....next time). Once we made it to the hospital, the pain had started to subside. However, we still decided to get a chest x-ray and some other tests on my heart. To the doctor's confusion, my heart looked and acted perfectly fine and he could not give a reason for the pain I had felt (I promise I'm not a hypochondriac! ), so we went home. Over the next two years, these unusual sharp pain in the left side of my chest would return for a few minutes every couple of months. I found that if I just laid down and tried to wait it out, the pain would usually go away. Eventually I got used to it. However, on October 15th, 2001, as I was shopping at the mall, suddenly the obnoxious pain came back again. I thought, "Here we go again. Just wait it out." But this time was different. By the next day, the pain had not subsided, and I could hardly take a breath. When I leaned forward or backwards, it felt like something inside of me was actually moving around. My parents decided it was time to take me back to the emergency room. After another round of x-rays, I was informed that my left lung had collapsed due to a condition known as "spontaneous pneumothorax". As far as I understand it, spontaneous pneumothorax is a congenital factor (not really a disease) that will sometimes cause the lungs of tall, skinny, (good-looking) young men to collapse. Due to the skinny frame, the chest cavity grows too tall and the lungs don't develop quite right. Small air pockets called "blebs" (I'm not joking. Look it up!) develop on the outside of the lungs. The blebs will then sometimes spontaneously rupture for no good reason. I've long tried to find some correlation for why the blebs rupture, but in my case, I was never doing anything unusual at the time of a collapse. Typically, a collapse would occur when I was playing Nintendo (See? Video games ARE violent! ), walking, or even just reading a book. On October 17th, I went back to the hospital for emergency surgery. Dr. Collins (my all-time favorite Catholic) inserted a chest tube through my ribs and into my lung. The chest tube helped to keep my lung inflated while Dr. Collins performed a surgery known as a pleurodesis thoracoscopy, in which my lung would essentially be "roughed up" and abrased to the outside of the chest wall. I have always pictured the surgery as Dr. Collins using sandpaper to make the outside of my lung nice and bloody so that it would scar together to the chest wall (sorry to be gruesome). Therefore, in the event of a future bleb rupture, the lung would hopefully stay inflated since it was stuck to the chest wall. The surgery was successful, but I had to stay in the hospital for nine days to make sure my lung didn't collapse again. During that first stay in the hospital, more than 120 people came to visit me. I felt incredibly loved, and to this day, I am still extremely grateful for everyone who cared for and prayed for me. Throughout the entire ordeal, my mom was always right there by my side. She worried about me so much, and I knew that if she could, she would have traded me places so that I wouldn't have to suffer. I got out of the hospital on October 25th, one day before my older sister Amy's wedding. Unfortunately, I missed the actual wedding, but I was able to make it to the reception that night. The reception center even had a couch for me to lay on during the event, since I couldn't really stand. 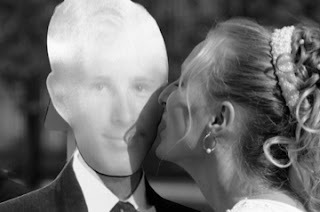 My mom made a cardboard cut-out of me so that I could be a part of the pictures at Amy's wedding. For me, the highlight of the night occurred when President Monson arrived. Amy had invited President Monson to the wedding reception because my new brother-in-law Manny's grandpa had fought with President Monson in the U.S. Navy during World War II. We didn't know if he would actually come, but it was so awesome to see him walk through the doors. 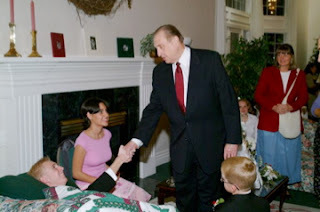 President Monson spent ten minutes visiting with me and told me that the Lord loved me, knew what I was going through, and that when things became too hard I should just "try to take things one step at a time". It is a memory that I still cherish to this day, and I love President Monson for his incredible goodness and true Christlike example. I gave him my best missionary handshake. President Monson visiting with me, my friend Melanie, my grandpa, and my little bro Matt. President Monson is the most wonderful example of Christlike charity that I have ever seen. With all his responsibilities as president of the Church, he still takes the time to visit "the one". He cares about every individual member. I know that he is a prophet of God, and I want to follow and sustain him every day. After the wedding, I did my best to recover. I made it back to my first semester at the U of U, and things finally felt like they were getting back on track. Unfortunately, exactly a month later, the sharp pain returned, but for the first time it was on the right side of my chest. The pain was overwhelming, but even more overwhelming was the realization that I would have to once again go back to the hospital for another surgery. I bargained with Dr. Collins to let me wait a couple of weeks so that I could finish my finals (ironically, bad grades was more of a worry to me than the prospect of dying). On December 11th, I finished my last final at 12:30 PM, and I was admitted to the hospital a half-hour later. That evening I ate my last meal before surgery the next morning (some jello and stale french fries) and then tried to go to bed. Sadly, my mind would not calm down. I got out my laptop and spent a couple of hours IMing one of my wonderful friends, Colin. Colin helped me to calm down and I was finally able to go to sleep. The next morning Allison, my favorite nurse in the whole entire world, came in to give me some medicine to help knock me out before surgery. After getting the shot, my mom said that I told Allison, "I'm completely coherent! I can do calculus!" The surgery on my right lung was a success, but the night after the surgery was rough. After surgery, I was hooked up to a morphine pump that allowed me to receive morphine into my system every six minutes if I needed it. 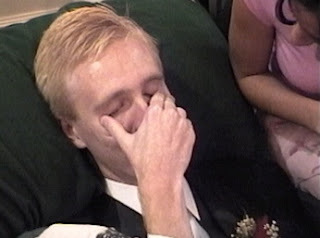 Unfortunately, I began throwing up, which was very painful due to the fragile state of my lungs. To deal with the pain of throwing up, I would press the morphine button as often as I could. However, the morphine became too much for my skinny frame to handle and I started to shake uncontrollably. At about 10 PM, on Thursday, December 13th, I experienced an excruciating convulsion that lasted for what seemed like forever. My best friend Paul and my mom had to hold down my legs while the others went to get warm blankets to cover me with. The resident doctor gave me some medicine called demerol to help with the shaking. Unfortunately, it turns out that when you mix morphine and demerol, it has the nasty side effect of putting your lungs into a state of "respiratory depression" (meaning they stop breathing). My mom ran to get Allison, even though she was in a room with another patient. Allison instantly noticed that I was in respiratory failure, and she issued a "Code Blue Emergency" which brought other medical staff scrambling to my room. At that moment I was clinically dead. As staff began to fill my room to carry out emergency procedures, my mom stepped out into the hall, worried that she would never see me alive again. Fortunately for my mom (and even more fortunately for me), the incredible medical team was able to get me breathing again. I remember suddenly opening my eyes and feeling the most intense pain of my entire life. I was freezing cold and I was shaking like I have never shaken before. I frantically looked around the room and saw Allison and my mom above me to the left. There was a mask on my face to give me oxygen. Suddenly, I sat up and threw up.....all over my mom. She told me that although it was disgusting, the fact that I was alive completely made up for it. I have so much life to live. I feel like I still have work to do here on earth, and I am so grateful for the chance. Let me just say, I love you, mom! Anonymous, thank you so much for reaching out to me. Dealing with spontaneous pneumothorax was one of the hardest things I have ever had to go through. In my next post, I am going to hopefully finish the rest of my lung journey story. I hope your husband is doing well, and that he doesn't give up. God bless you both as well! Thanks for sharing this story, Steve. Thanks Aaron. Mom's are rad. Thanks Jocelyn! Oh, and thanks again for showing me how to get the Book of Mormon link on my sidebar. I remember this like it was yesterday. And it was awful. I also remember the morning after this happened, Paul sent me an e-mail detailing the experience and I talked Val into driving me home before either of our finals were completed! Scary stuff, friend. So glad you're okay now though! Your mom is completely and utterly awesome; it's true. Aliese, thanks for being such a great friend when things were so hard. I was blessed then, and I'm still blessed now. I'm glad you shared this. And I'm glad your mom turned back. Thanks Michelle. Me too. Sorry to read about your broken foot. Steven, you truly do have an amazing mother. I can't imagine how terrifying these hospital experiences must have been for her. I'm so glad you are healthy and recovered now. Wow! I did not know the whole incredible story. Thanks Steve for sharing, you are amazing as well as the lovely Diane! Moms rock, especially yours!! As a "MOMMY" , just knowing that she brought you n2 this world & helped you stay was more than enough thanx, i'm sure! I was some moved by this. I am a Mom. I am an RN and last but very egual to the other two I am a proud member of The Church of Jesus Christ of Latter Days Saints. I am a Mormon And very proud of all! I am so glad you got through this but with all the true blessings in your life it is no wonder you did! I would give anything to meet our Prophet. He inspires our faith and moves us to the copacity of wanting to be better people and Christians. Thanks for sharing this story and God bless! You just made my day. Thanka for your kind words. I love President Monson! Dear Steve, I have 5 grown married sons. I was amazed that all said and done we never had any broken bones or other disasters. I am on the "like" list of several LDS sites, for this exact reason... So I get posts like this. Wow what a story. I`m grateful you shared and grateful you are doing so well now. I`m sure most every active, faithful member of the Church of Jesus Christ of Latter Day Saints would love to have the Prophet stop in and check on us when in an awful health situation. Maybe you have heard the saying people some times say.. "I would die for a chance to ... whatever it might be. I don`t use that because I wouldn`t be willing to die. Like your mother I would rather it be me than one of my sons or my 15 grandchildren. I would also like to tell you that I have had many experiences of hearing, and obeying that still small voice, it is such a touching experience. I have had some where around 8 surgeries, none are fun, but one (to take out my gallbladder) I for the first time went against the Dr. being able to give me a blood transfusion if need be. I felt so adamant about it and did not know why, but went with my gut feeling. All said and done they could not get my body to stop bleeding. (I was on some herbs for the heart and had no clue it had blood thinning properties about it.) Back then we didn`t have the list ask us if we were on any herbs or supplements. I was so grateful that my surgeon was a faithful LDS man because when my bleeding became a concern my regular dr. wanted to give me blood even though he knew that I signed a legal document saying no blood, my surgeon having prayed that morning as always and said another prayer of guidance at that precise moment received the answer that was needful. His faith and answers to his prayers told him all would be well and things calmed down. Right after surgery my regular dr. was mad and let my husband know it. I love hearing about the hand of the lord in any ones life. I didn`t find the gospel of Jesus Christ until I was 16, that is another beautiful story all by it`s self. I love it and have no clue where how my life would have been all these years without it. So my thought is if you are not already married, then you have a special young lady waiting for you to find her and I know you will always remember this experience and will lead your wife and children by the proper teachings of the gospel and will be a strong leader in the home and in all of your callings in life. I`d love to be a fly on the wall watching your life meld and play out as Heavenly Father already has plans for it to be so. Take care, Good Luck and know that you have touched many lives here just by the simple act of sharing. One of your sisters and friend in the Gospel. Wow. Thank you for sharing your story. I KNOW that God is aware of us and loves us more than we can comprehend. I KNOW IT! A nice story,i enjoyed reading it.I wish my mum was like yours.